When the “Main Street Electrical Parade” returns to Magic Kingdom for a limited engagement this summer, the cherished Disney nighttime spectacle will have a new glow. Tinker Bell will sprinkle her pixie dust to illuminate the classic parade. The parade’s highly recognizable musical theme will be brightened by new technology. The parade, which normally is featured at Disneyland Resort in California, was last at Walt Disney World Resort from 1999 into 2001. But as it returns to Magic Kingdom to headline “Summer Nightastic!” June 6 through Aug. 14, 2010, “Main Street Electrical Parade” will be showcasing lots of features never before seen – or heard – in Florida. Tinker Bell leads the procession on an all-new float, and her trail of pixie dust enchants all the parade floats with new beauty along the way. The popular pixie waves from the basket of a balloon floating gracefully above a magical garden shimmering with fairy light. In addition, enhanced versions of two classic favorites will return to the lineup after a 13-year hiatus – the shimmering diamond mine of Snow White and the Seven Dwarfs, and the Pleasure Island haunts of Pinocchio. Time: Nightly beginning Sunday, June 6, and continuing through Saturday, Aug. 14, in Magic Kingdom at Walt Disney World Resort. Check the Park Times Guide for schedule. The parade twinkles with approximately half a million lights. Of those, nearly 10,000 are new “pixie dust” lights spread over the 23 parade floats. The new LED lights use one-quarter of the power of incandescent lights. 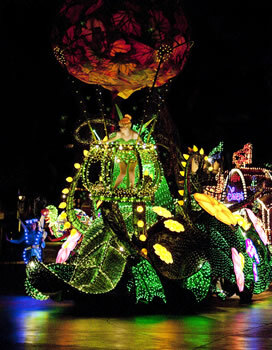 The Tinker Bell float alone has more than 25,000 points of light and 75 percent are powered by an LED source. There are 11,000 lights on the dancers’ costumes alone. Thanks to the energy-efficient LED lights, some of the dancers’ costumes now carry only one battery pack instead of two. The unforgettable musical theme of the “Main Street Electrical Parade,” which has inspired several generations of Disneyland Resort guests to clap along, was adapted from a synthesizer piece known as “Baroque Hoedown,” written in 1967 by Gershon Kingsley and Jean-Jaques Perrey. Disney themes are superimposed over the original piece. For “Summer Nightastic!,” the distinctive “electro-sytho-magnetic” “Baroque Hoedown” has new audio technology that gives it a richer, fuller sound. All the floats are battery-powered. More than 500 batteries supply power for lighting, propulsion, audio and special effects. Approximately five miles of wire is used throughout the floats. The tallest float in the parade is the Cinderella clock tower, at 18.5 feet tall. The Fireworks Finale float, the longest in the parade, has seven cars that span 118 feet. “Summer Nightastic!” 2010 will mark the return of the original Disneyland “Main Street Electrical Parade” to Walt Disney World Resort. Previously the parade had a limited engagement in Florida from 1999 through 2001. The original “Main Street Electrical Parade” premiered at Disneyland on June 17, 1972. The parade was presented at Disneyland nearly every summer until it was “retired” in 1996. A version of the “Main Street Electrical Parade” was created for Magic Kingdom at Walt Disney World Resort in 1977. The Magic Kingdom version was presented until 1991 when it was replaced by “SpectroMagic” (“Main Street Electrical Parade” was refurbished for the opening of Disneyland Paris). The original Disneyland “Main Street Electrical Parade” was brought out of retirement and extensively refurbished for a limited engagement at Walt Disney World Magic Kingdom from 1999 into 2001. The parade has been performed more than 5,000 times at Disneyland Resort. The original “Main Street Electrical Parade” floats were “flatter” and less three-dimensional than the current floats. While new floats have been added through the years, some have been retired: “it’s a small world” float, Briny Deep float, and special anniversary floats for Disneyland’s 25th Anniversary (1980) and Mickey Mouse’s 60th Birthday (1988). One of the original floats, the Title Drum Unit near the beginning of the parade, was created using an actual bass drum, one of the world’s largest in 1972. This drum had been used in Disneyland parades in the 1960s, when Mickey Mouse used to beat it using large drumsticks. A third version of the parade has been presented at Tokyo Disney Resort (premiering 1985).